Sanus' ultra-thin VisionMount® VLF320-B1 holds your medium-sized or large flat-panel TV just 1-1/4" from the wall when fully retracted. 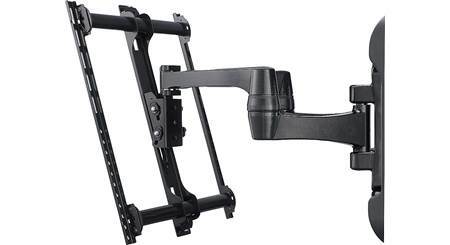 Just pull on the mount and it smoothly extends outward up to 20". The mount's decorative cover conceals the assembly and hardware, giving it a finished appearance that complements your TV. An integrated cable management system keeps wires organized and out of sight without interfering with the motion of the extending arm. This durable heavy-gauge steel mount supports a TV with a screen size up to 70" and weighing up to 120 lbs. The mount's brackets can easily be shifted to the right or left, in case the wall studs are a little off-center. And you can make fine adjustments after installation to keep your TV leveled. 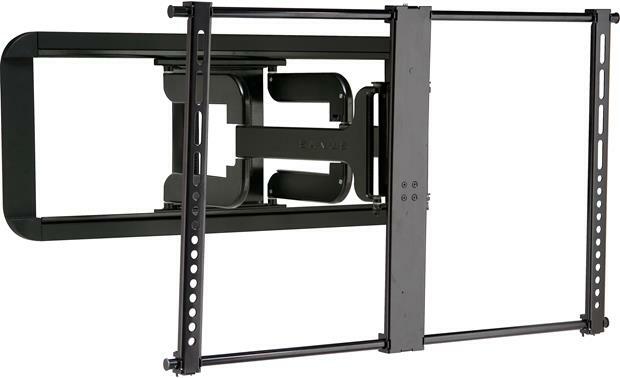 fits most flat-panel TVs with screen sizes from 51"-70"
Great sturdy mount. Warning though that I bought mine "scratch and dent" or open box and it was in the worst condition of any open box product I have ever received. I had to epoxy several of the plastic parts back together. Will this mount work for a curved tv? Specifically the Samsung UN65JU7500. Yes it will but the single arm mount works better. Overview: The Sanus VisionMount VLF320 is a super-slim, full-motion wall-mount for large flat-panel TVs and monitors. This full-motion mount allows you to easily aim the TV for viewing virtually anywhere in the room. The mount can tilt, swivel, and extend in every direction so you can attain the perfect viewing angle. This mounting bracket, black in color, features a built-in cable management system to conceal and protect your cables. The mount is ultra slim, placing your TV only 1.25" from the wall, but can extend up to 20.8125". Construction: The wall-mount bracket is made from solid heavy-gauge steel, with a durable powder coated black finish. It comes with a decorative cover to hide assembly and mounting hardware for a finished appearance. Capacity: The VisionMount VLF320 is designed for 51" to 70" flat-panel TVs. It has a maximum weight capacity of up to 120 lbs. Full-Motion w/ Fingertip Tilting Technology: You can laterally shift the TV along the wall plate for ideal placement. Fingertip tilting technology provides smooth tilting with the touch of a finger from 0° to -10°. The VLF320 can sit as close as 1.25" from the wall or extend out from the wall up to 20.8125". You can also swivel the wall-mount up to +/- 33°. When you have positioned the TV where you want it, you can lock the mount into place to prevent further movement. Post-Installation Level Adjustment: Post-installation level adjustment allows the TV to "roll" up to 1.5º clockwise and counterclockwise to ensure it is perfectly level, and lateral shift ability makes it easy to center the TV on the wall, even with off-center studs. Cable Management: With its integrated cable management system, the VLF320 keeps loose cables organized and concealed within the extension arm for a clean appearance without compromising TV motion. A decorative cover also conceals assembly and mounting hardware. Wall Mounting: The wall plate must be mounted to a wood wall stud (16" to 24" on center) or a solid concrete or concrete block wall. It is not designed for use in metal stud walls. The wall must be capable of supporting five times the weight of the TV and mount combined. Tools required for mounting include: a Phillips-head screwdriver, 1/2" socket wrench, electric drill, 7/32" drill bit (for wood studs), and 3/8" masonry bit (for concrete or block). To properly position the mount, you'll likely need a pencil, awl, level, tape measure, hammer, and stud finder as well. Wall Plate: Width = 31.5", Height = 13.1875". Depth = 0.875"
TV Bracket Assembly: Width = 32.1875", Height = 19.6875", Depth = 1.25"-20.8125"
Vertical Brackets: Width = 1.4375", Height = 20.125", Depth = 1.0"
Richard, which single arm mount are you recommending? I am also looking to purchase a Samsung UN65JS9500? John, We purchased this mount in April of this year for our 65" flatscreen. The TV feels secure and solid while using the multi motion. Also, the TV is close to the wall when pushed all the way back. Lastly, everything that was supposed to be in the box was in the box and everything Sanus includes made the installation a breeze. Yes, I have it as the wall mount for my curved Samsung 4K 3D 65 inch tv. 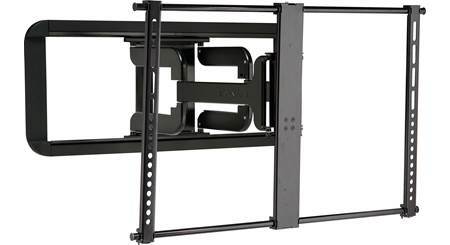 Searches related to the Sanus VLF320-B1 Super-slim full-motion wall mount with articulating arm for flat-panel TVs 51"-70".